Self-sustainability is quite the urgent imperative when travelling into virtually the middle of nowhere (in my case the middle of the Nevada desert). Thankfully I did stock up on a whole heap of So Organic products to take to ease my journey (practical and comfort wise) into the dusty plains of the Black Rock playa. Number one must have is baby wipes, especially if you’re unsure whether you’ll be near watering hole or shower facility. In my case I knew I was going in to the desert for 9 days. We had to take all the water we’d need (for drinking and washing). Even with an RV or campervan you need to take care of water usage, as the locals constantly remind you of the water droughts and restrictions. 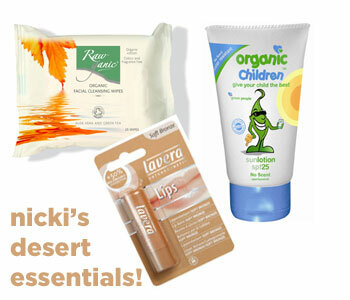 Baby wipes are a godsend to clean your body with, particularly when it’s covered in desert dust. The organic ones are definitely the best as they are softer than conventional brands and moisturise as effectively as they clean. My only issue with them was I didn’t have enough – one pack for 9 days of desert is just short of what you need for a full body wash every day. I also took a packet of organic facial wipes – these are invaluable if you’re used to a daily cleansing routine (I’m used to using the Dr.Hauschka cleansing Cream and Rose Day Cream). The face wipes meant I could still clean my face without using water. Instead of the Rose Day Cream I used the Trilogy Daily Defence Moisturiser with SPF15 because it has extra benefit of a sunscreen in it. My skin stayed softer than just about anybody on the playa for this reason! The number two essential is lip balm. In a dry, windy, dusty environment keeping your lips nourished is a must. If the wind doesn’t dry them out, the sun almost certainly will without a good lip salve. I took Lavera’s Soft Bronze Lip Balm because it gave me a little shimmer as well as protection from the elements. Sunscreen of course is needed when you go anywhere hot and the deserts of the earth are of course the hottest place to sun yourself. I was given a tube of the Green People SPF25 Children’s Sun Lotion (No Scent) some time ago and this was the first chance I’d had to trial it in any hot weather. I was surprisingly ecstatic (I never thought I’d have such a reaction to the mere workings of a sunscreen!) to discover that this sunscreen works so brilliantly. I didn’t get burnt at all, it soaked in right away (no grease whatsoever) and I didn’t feel (or rather smell) like I was wearing sunscreen whatsoever. A must have for kids and adults soaking up the sun for sure. One more essential (only if you’re going to a festival or party in the desert) is bright bold make up. Between the three of us we only had a few colours (you can’t fit too many luxuries in 6 month intended usage backpack you know). The Blue Topaz eyeshadow by Inika goes a long way – bright and dazzling – perfect for a dress up arts festival in the middle of the desert! No matter where you spend your holidays in the great outdoors (be it camping in the UK, hiking in the Swiss Alps or biking it across Tuscany these are very useful ‘roughing it essentials’ to take with you.